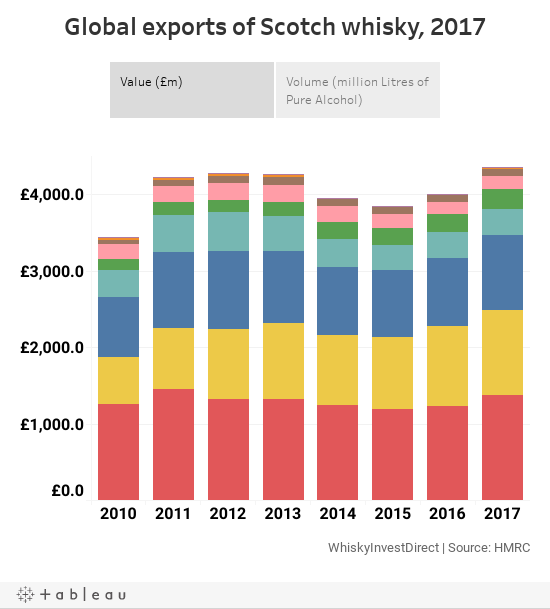 SCOTCH WHISKY exports earned more in 2017 than ever before, writes Leon Kuebler for WhiskyInvestDirect. According to figures published by HMRC, a total of £4.36bn worth of Scotch whisky was sent overseas in 2017. This was an increase of 8.9% on 2016, and beat the previous record of £4.27bn set in 2012. The volume of Scotch exported increased, too, growing by 1.6% year on year. More Scotch was consumed worldwide in 2017 than in any year since 2011, when a record 354.4m LPA was sent overseas. Overall, 345.1 million Litres of Pure Alcohol (LPA, standard industry unit) were dispatched between January and December of last year – the equivalent of more than 39 standard bottles of Scotch every second. The number of Pounds earned from Scotch whisky exports grew at a much faster rate than the amount of Scotch consumed worldwide. To some degree, Scotch has benefitted from the ongoing weakness of the Pound following the vote to leave the EU in the June 23, 2016 referendum, which has generally made UK exports cheaper to buy overseas. But recent years have also seen the ongoing ‘Premiumisation’ of Scotch whisky products, with rising demand for more limited luxury products experienced worldwide. According to data published by the IWSR, the Super-Premium, Ultra-Premium and Prestige categories were the fastest growing sectors for Scotch over the last five years, with global consumption of increasing by 6% in 2016 and by 16% since 2012. This trend was seen in all major categories of Scotch. Exports of single malt Scotch, which topped £1bn for the first time in 2016, grew by 14.2% to break the £1.1bn barrier, with volumes growing by 8%. Blended bottled whisky, which represents over two-thirds of the volume of Scotch sold abroad, also rose by 7.9% to reach an export value of £2.87bn, despite volumes only growing by 0.8%. Double-digit rises in spending on blended Scotch occurred in Scotch’s biggest market, the European Union, for the first time since 2011, as well as in its third-biggest market, Asia & Oceania. As a result, shipments of blended Scotch generated more revenue than at any point since 2013. 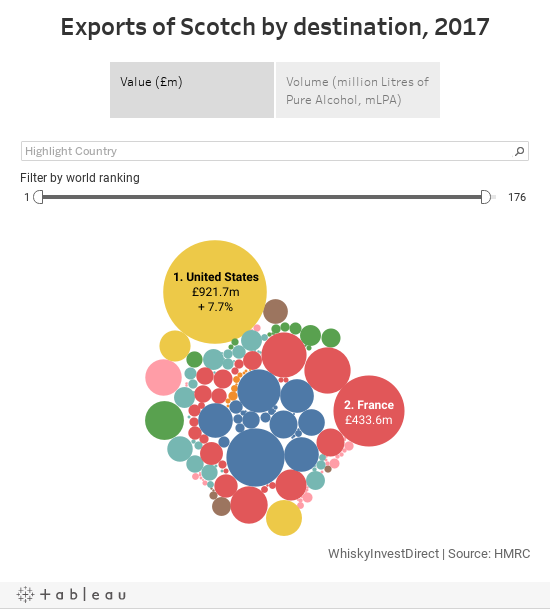 Exports to the United States, Scotch’s biggest market by value, grew by 7.7% to reach £922m, with the total amount of Scotch shipped rising by 7.4% too. Dispatches to France, the world’s biggest consumer of Scotch, decreased by 5.9% in volume, but still rose by 2.1% in value to £433m. Huge increases were also seen in the value of shipments to major markets. Singapore, the third-largest market for Scotch and a long-standing entry point for products to China, imported £290.7m worth of whisky – an increase of nearly 30% on the previous year. Even more significant was the performance of Latvia, which more than doubled its spending on Scotch from the previous year. With a population of around 2 million people, this country is now the 8th-most-valuable market for Scotch, due to its role as a hub for exports into Russia. Other long-established markets performed strongly, too. Double-digit increases in spending were seen in Germany and South Africa, the fourth and ninth most valuable markets for Scotch respectively, while spending on Scotch in Japan, the world’s second-largest producer of single malt, rose by 18.8%. The only top-10 market to register a sizeable drop in spending was Taiwan, where the value of Scotch exports was down -8.3% on 2016.